Welcome to the Hideaway, a boutique hotel in Windermere. 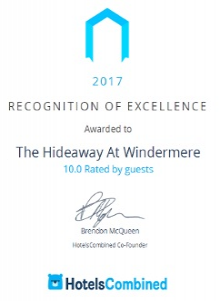 The Hideaway boutique hotel is the ultimate luxury retreat, located in the beautiful and peaceful grounds surrounding Windermere. With a commitment to offering complete relaxation, we have a passion for indulging our guests during every moment of their Lake District stay. All you need to do is choose from one of our eleven completely refurbished, hand-picked, one of a kind bedrooms and enjoy your time with us. Of all the boutique hotels in Windermere, we are the only one that offers complimentary tea and homemade cakes on a daily basis. We're also famous for our award winning Lakeland breakfasts - making The Hideaway Hotel the perfect choice for those seeking something extra special on their short break. With no passing traffic, our peaceful retreat is exceptionally quiet, yet we still offer easy access and onsite parking for our guests. 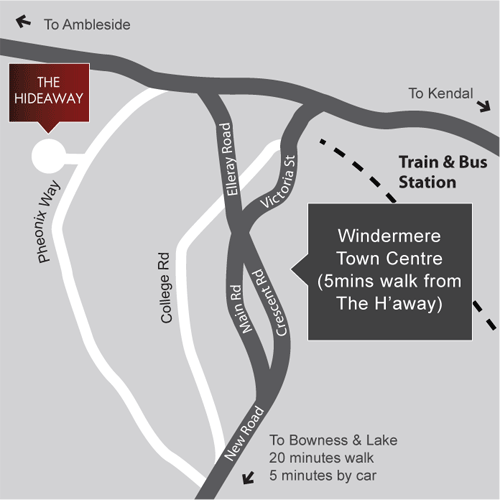 Furthermore, we're only a five-minute walk to Windermere Village and just a 20 minutes walk to Bowness and Lake Windermere. This makes The Hideaway the perfect spot to explore this beautiful area and experience everything the Lake District has to offer. Completely non-smoking, our beautiful hotel offers exceptional service and delicious food in relaxed stylish surroundings. Click here to discover the ins and outs about your stay at The Hideaway Boutique Hotel. We hope to welcome you very soon to our Windermere retreat.